What fun, and our last one for January! 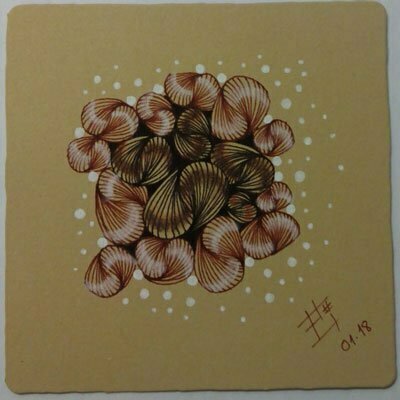 Spanish CZT Pilar Pulido’s delightful Roloflex tangle is her first on the site. 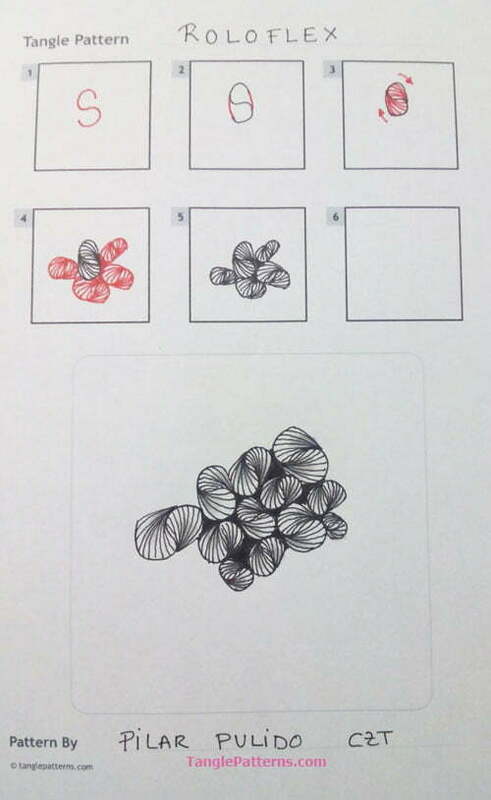 I live in Madrid (Spain) with my family and I fell in love with Zentangle® in my first contact with it. I’m one of the lucky students of María Tovar, the 1st CZT here in Spain. I’m also a CZT since April 2017. Although I’m not fully dedicated to teach it, I hope being able to collaborate to spread it. Regarding “Roloflex” story, it came to me from an exercise with “S” shape string at the same time that my son was studying something related with tangencies at school. So, I named it in to honour him with this funny word he uses a lot in his personal vocabulary but which has no meaning: Roloflex. Roloflex is simplicity itself, composed elegantly of S shapes and inner auras. It can easily work as an individual motif, in a row as a ribbon or border, or as an all-over pattern as Pilar demonstrates here in a pretty ZIA on a Renaissance Tan Tile where it appears almost shell-like. 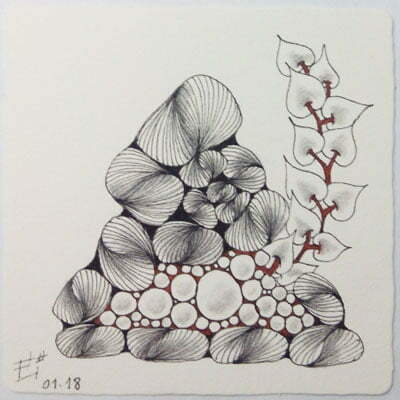 Here Pilar features Roloflex with the Zentangle-originals Pokeleaf and Tipple on a white Zentangle tile with a spot of color and beautiful shading. 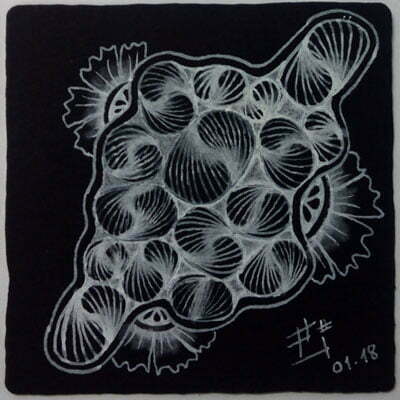 And Roloflex fashioned in white ink and white charcoal pencil on a black Zentangle tile with Henna Drum motifs sprouting from its aura. Pilar writes that her website is still under construction. Check out the tag pilarp for more of Pilar’s tangles on TanglePatterns.com. So simple, so elegant. Thank you, Pilar. uncomplicated but wonderful new tangle, gracias! Thank you, very nice and easy to do. Can be used in many ways! Thanks Pilar – I will enjoy this tangle! Easy to do and looks beautiful! Oh, I love this one! Can’t wait to try it. Thank you. What a gorgeous combination of texture and fluidity! Mesmerizing. I love this tangle! Thank you Pilar! I love getting lost in repetitive, uncomplicated lines that just flow. Love it. Any tangle that starts with an S for me and my name is a go! Thanks. Love! Can’t wait to try it! Thanks for sharing. Pilar this is beautiful! Going to practice this while waiting for my daughter at her dental appointment this morning. My tangling tools already in my purse. Thank you for sharing and thank you Linda for introducing us to Pilar! Thanks a lot Linda, for publishing my tangle and to everyone who has left one of the appreciated comments. Thank you, I feel very happy ! That`s a really neat and simple tangle, Pilar. This is so addictive! Very flexible, too. I love it! Thanks, Pilar!